Administrators of an organization account can remove submissions from their database after a submission has reached a terminal status of Accepted, Declined, Completed, or Withdrawn. If the submission status is still In-Progress, the Delete function will not be available. To change the status of the submission, locate the submission on your Submissions List and then check the checkbox to its left. Click either the green Accept, red Decline, or blue Completed button. Note: The Delete action is not reversible and is only available to organizations. Once a submission is deleted, it can't be retrieved. For this reason, we highly recommend that you export your submission data. 2. 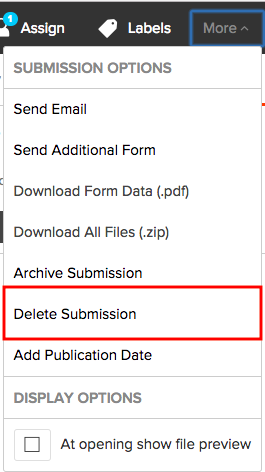 On the Submission Details page, click the More menu at the top of the page. 4. A dialog box will appear asking to confirm the deletion. Click OK.